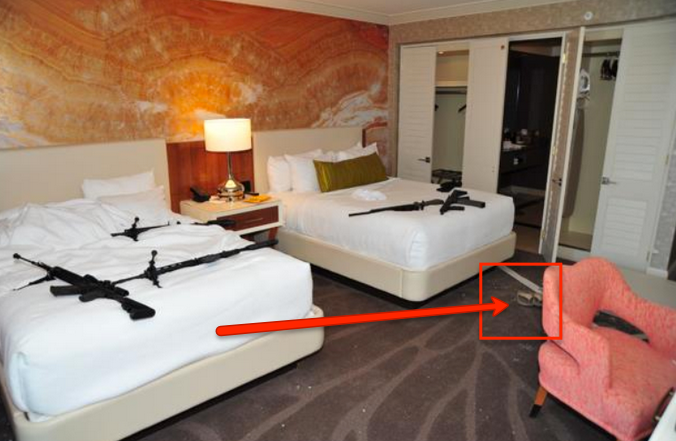 As Intellihub reported on 10 Oct., over a week before the release of the prelim report, there is no way that Paddock could have made his way back and forth between the two rooms, as Sheriff Joseph Lombardo previously stated on the record. This action would have been physically impossible because the adjoining door to room 32-134 was dead-bolted shut at 9:46 p.m., about 14 minutes prior to the first volley of fully automatic gunfire, as the official report indicates. To top it all off, the report states that at 9:36 p.m. the dead bolt for room 32-135 was engaged which proves that both doors were locked at the time of the shooting as if the perpetrators had planed it that way.